There’s nothing better than opening a card that someone has made especially for you! To make it even more of a surprise, we are going to show you how to create this awesome exploding box design that will most definitely leave a lasting impression! Download our free template and find out how Maxine has brought this creation to life with the most fabulous crafting collection out there, Kiss and Makeup! Dovecraft Kiss and Makeup 8x8 Paper Pack, Dimensional Stickers, Gems, Tags and Washi tape. 1. Print the free template, cut out of the A4 card stock and cut and score where shown. 2. Cut two 6.5 x 16 cm pieces of paper and adhere to the two inside back panels. Cut the triangular shapes out of a different Kiss and Makeup paper design and adhere to the sections. 3. Cut another two complementing Kiss and Makeup pieces for the outside sections, mark where the score line is and cut. Adhere to the card. 4. Adhere the card together, using Dovecraft Perma Fix tape. 5. 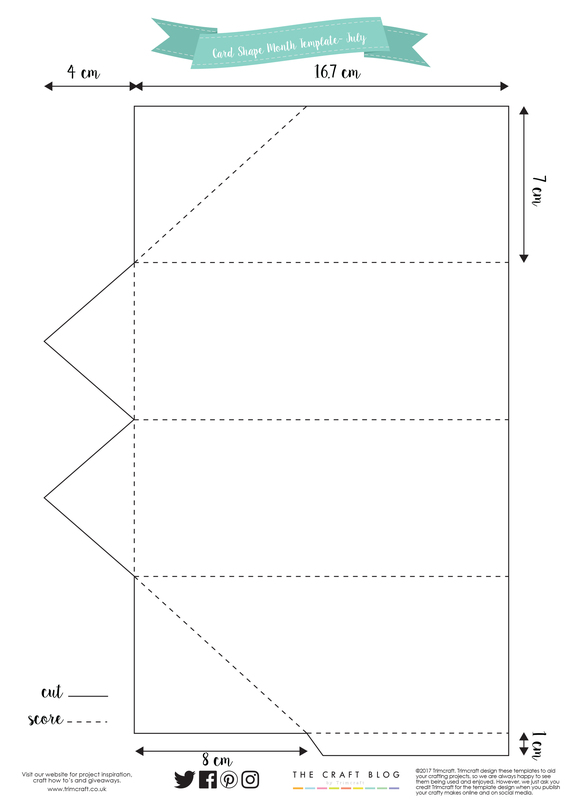 Cut two strips of card 1cm x 10cm, score at 1cm at each end. Adhere to the inside of the card, with strong tape. Tip- make sure your card folds flat with the strips in. 6. Cut 5 strips of card 1cm x 12cm and cover with a backing paper. Add a Kiss and Makeup dimensional sticker to the top of each one and cover the back with paper to cover the rest of the sticky area and cut around the edge. Adhere a Kiss and Makeup heart tag to the back of the nail varnish bottle, add 3 glitter dots. 7. Adhere the stickers onto the card strips inside the card. TIP Hold the pieces in place to see where you want it to be and cut to length, before sticking. Add a dimensional sticker to each of the flaps on the outside. 8. Adhere a piece of Kiss and Makeup Washi Tape around the bottom of the card shape. TIP - It's easier to cover the card with papers while it's still flat. The illustrative Kiss and Makeup designs are SO pretty, your friend will want to display thiscraft next to all their favourite beauty goodies- a perfect reminder of how fabulous they are! How will you use our exploding card shape template? We’d love to see, so don’t forget to #trimcraft when uploading to social media and to share your makes in the Inspiration area! Love this card shape, will definitely try this one. How can you adhere the tabs inside the card so it still folds flat. Or do you just adhere to one side?